you were to Israel a forgiving God, though you punished their misdeeds. I said, “I will confess my transgressions to the LORD” – and you forgave the guilt of my sin. who love, follow, learn from, and worship God together. The Summer Retreat is THIS Weekend! As we look forward to our time together let us be praying that the Lord would guide us through the weekend and soften our hearts to make His love known more. Registration starts at 4:00 PM on Friday, July 31st. Dinner is not provided so please plan your own. At dusk there will be a campfire with snacks. On Saturday breakfast is at 8:30 AM with the first sessions starting in the Cedar Room at 9:15 AM. We will be staying in rooms with bunks. Families will have their own room and then couples and singles will be divided into rooms of men and women. The linens provided are pillows, blankets, pillowcase, sheets, washcloth, and bath towel. This address will get you to the correct location via Google Maps. When it says you have arrived at your destination continue straight to Gate 3, then turn left and park at the gym. Take I-94 West toward Milwaukee and exit at Hwy 50 (just past the IL/WI border). Go West on Hwy 50 to Lake Geneva (26 miles). Turn left onto Hwy 120 (Edwards Blvd.) at the Wal-Mart. Proceed on 120 for about a mile then turn right onto Bloomfield Rd. Continue straight ahead through the 4 way stop, Bloomfield Rd. becomes South Street. Turn left at Gate 3 and proceed to the gym parking lot. Once you have parked in the Gym parking lot, which is accessible from Gate 3, follow the signs back up the way you drove in to the Bayview Center / Cedar Room where you will find all the registration information and room assignments. Please make sure to sign in so we know the correct amount of people spending the night and eating meals for the Conference Center. 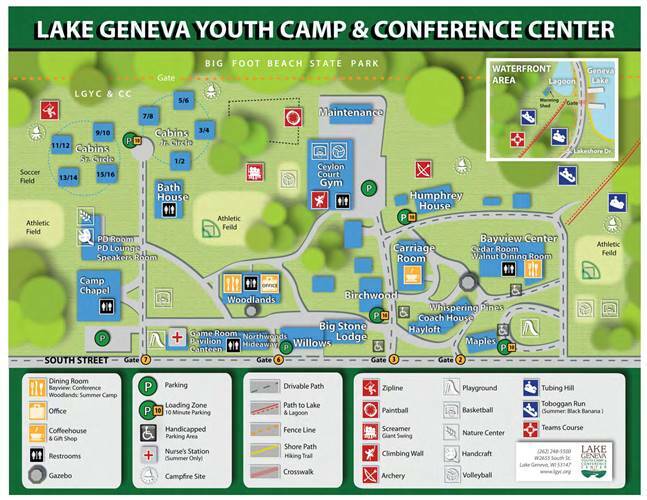 A map of the Conference Center is attached for your reference. Almighty and merciful God, we have erred and strayed from your ways like lost sheep. We have followed too much the devices and desires of our own hearts. O Lord, have mercy upon us. Spare those who confess their faults. This Sunday is the third Sunday of July and you know what that means! TABLE TALK!! So don’t worry about lunch plans this week. Lunch is on the church. Stick around after the service and get caught up with someone or get to know a new person. No. Christ died once for all. Money should not prohibit anyone from coming, however. Give what you can. We are excited about the Retreat and the sessions that we will have together. Along with that there are many activities outside of the sessions that will take up the 3 hours of free time that is available in the afternoon. The list below shows all the free activities that one can participate in throughout the day. 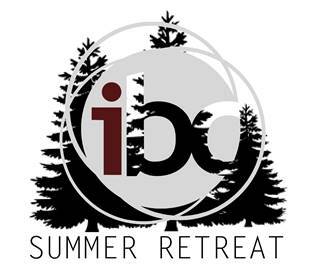 As well, there are many paid activities below that are not included in the cost of the retreat through IBC. If you would like to participate in any of these paid activities please get a group of people together that fits the minimum requirements. I need to know (1) what activity you would like to do, and (2) who is doing it with you. This must be completed by Monday July 20th. If you end up adding on any paid activities please add this on to your suggested donation to help cover the cost for IBC. $175/1st hr. & $150/ea. additional hr. and by his wounds we hare healed. able to keep his whole body in check. My brothers, can a fig tree bear olives, or a grapevine bear figs? Neither can a salt spring produce fresh water. See, your guilt is taken away and your sin atoned for. No, only the blood of Christ can cleanse us from sin.